We pray this sharing finds you well and your families. 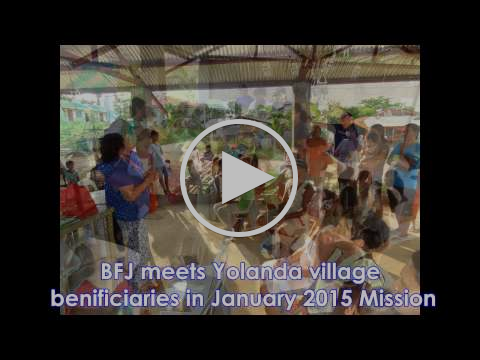 Thank you for your prayers and support for BFJ’s 20th mission trip which concluded last week. The trip was exhausting but had been blessed as ever and we praise God for His amazing timing, good health and provision for His workers in the fields. In every mission, we take home one valuable lesson, we learned to forget one thing: self-importance decreased to increase in HIM. By far, the completion of Phase 1 of Housing for Jesus no doubt was the highlight of the trip, where we met the new home owners at the handover and blessing celebrations. It was a joyous occasion for both donors and awardees who finally have a permanent home after nearly 18 months of homelessness! We uplift them all in prayers and praise God for enabling all parties, contractors and helpers alike to move mountains to get this project off the ground. Special thanks to all donors represented by the Lyra Family who took the time to join this mission trip and even sponsored a banquet for the village! Truly a testimony of how the Lord increased while we decreased! Please use your browser to view BFJ’s newsletter compilation on the last mission, in an attempt to share with you where this mission reached out to. One might think the mission was too full on and spread out thin; however, diverse or tidious and compact it was, the appreciation and love we encountered made it all worth it. Children and adults alike told us that they pray we will keep coming back and will not get tired of remembering them. To us, this was just one of few visits a year, but to these people, they treasure and look forward to our next outreach for they cannot forget how much God has shown them His love…while serving them, we decrease in their midst, they see Jesus increased in us. God’s plans and will are always perfect in and in His time we will see the fruits of our labour to bear results and some may not happened in our lifetime. However, we are assured that we did it according to God’s enabling through His Holy Spirit and may He continue to inspire and move us all to foster His kingdom building and pray along with us that more will respond to His call to bless the least among us…we must decrease, to increase in Him! Highlight of this Cebu mission was the handover and blessings of Phase 1 of Housing for Jesus in Bogo north of Cebu which was graced by the presence of the City Mayor and one of the donors, Mr and Mrs Trevor Lyra who came all the way from Perth, Australia. Most of all, for all the awardees who finally moved into their very own homes after being homeless for nearly 18 months. Cebu Old folks homes - what a joy to prepare lunch, washed up after feeding 65 old folks at Mother Teresa's ministry in Cebu today. And also spent time with them, listen to their stories & prayed with them and encouraged abandoned folks not to despair. There is a huge number of old folks abandoned in this city. Please pray for them. Hundreds of inspirational Street children living in the slums of Cebu have learned to pray the Word of God and can even recite verses! Their richness in eternal treasures is more precious than their lack of material things which will one day perish but not the Word of God! BFJ Housing for Jesus Handover and Blessing. God bless you abundantly and a million thanks to all donors for Phase 1 of BFJ Housing for Jesus. Please pray for the rest of our mission and for more donors to come forward so there will be less homeless disaster victims here. Glory to God! YOLANDA Village installed a plaque for each house donated with its donor's name and awardee's names shown in each home and a signboard at the entrance of a block...a small token of appreciation from the deepest part in each hearts of these homeless families. Thank you all for responding to the call of our homeless brothers. Because of you, they are homeless no more today! Packing of buckets or gifts, Bibles in Cebuano or Tagalog each day was an integral part of the mission. We handed hundreds of buckets in both sectors to children, mothers and adults in age care and slum areas. Miracles abound each time we pack and the amount we give away plus left overs which don't tally for as always they multiplied right before our very eyes! The Missionaries for the Poor in Manila has 2 components, handicapped children and age care likewise, school children. Both areas we visited and played with the children and spent time with the old folks while the school kids came in to entertain us with music and dancing before we handed gifts to them. It was a blessed time there for BFJ sharing gifts to the least among us. From a dream to reality...for 400 orphans through the hard work of Joe Dean's ministry for the homeless. A walk through the slums at St Benedict's parish was an eye opener and requires a strong heart to fathom the degree of suffering poverty even in a nice subdivision area, poverty strikes with squatters living on vacant lands in between massive mansions. Makes one wonder how the rich can have peace of mind looking down from their mansions over the poorest of their poor neighbors and pretend every thing is fine! Close to 350 orphans and rejected children of the city lived here all their lives aging from 1 to 17 years old. The legal cost for adoption is too high for locals to afford. Only foreigners could and rarely they came, hence so many of these 350 orphans have a chance to be adopted. A very sad situation in almost every orphanage we visited. What a week of triumph and trials! Manila missions have not been smooth sailing due to heavy traffic jams up to 3 hours! The heavy rain cause flush flooding in areas we were in. But we were so blessed to have done missions in so many places within this week including He Cares Ministry, White Cross Orphanage, a visit at the Missionaries of God's Love, a walk in the slums, feeding programs with the Missionaries of the Poor and Mother Teresa's ministry for both aged and orphans. Words cannot express our heartfelt thanks to the Lyra family, Deacon Trevor and Deirdre who joined our mission to meet their adopted families and sponsored 6 Housing for Jesus. On top of that, they also sponsored the banquet for 700 villagers that night. What a blessing to all! God bless all new home owners and donors like Cheryl Ann Barich, Josephine Choo, Josephine D'Alessandro, PK Wong, Peter and Margaret Laundy, Joseph D'Alessandro, Michelle Butler, Helen Tan, Isabelle D'Souza, Florence Liang, Kris Liang, Lucy Tang, Flora Joanilho, APAC Ministry, Tetty Hakim, Teo Cheng Woon, Anita Kwan, Anthony Cheong, The Sala Tenna's and many more! You too can make a difference and be a part of Phase 2 Housing for Jesus for the Homeless! Thanks a million Fraser Place Manila! For hosting Buckets for Jesus' bi-yearly missions, year after year since 2009! You are god-sent and truly a blessing and a wonderful mission partner! May God bless you abundantly! The success of last year's spring roll drive which raised 4 Housing for Jesus (HFJ) inspired us to keep going this year. Two weekends of production have generated 1.5 HFJ and still going. 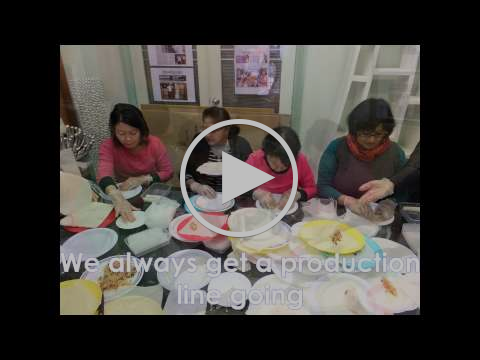 Thanks to the generosity of Dr Gabrielle Ly and her family, using her secret recipe for Vietnamese spring rolls, together with a host of volunteers, we are humbled by the efforts of this simple fundraising drive and the support we received by patrons alike. We praise God for all! We are currently taking orders for the next round of spring roll making this month. To order, pls contact us @ bucketsforjesus@gmail.com. Spearheaded by the dynamic Laundy family who raised one house for the homeless in April through a Garage Sale, they will host this event once again at their lovely home at Ocean Reef. Hence, we are looking forward to your support on this fundraiser. All plants, pots, potty mixes etc were donated and the goal is to raise one house for the homeless or $2.5k Hope to see you there! Campaign for this project will start after we return from BFJ's July mission. Please let us know if you would like to promote this at your youth group, parish or school and we can come to speak or send you flyers and more details on what are required for the shoeboxes. Details for our 2015 SFJ Campaign will be sent out soon. Priceless! The Power of Giving! Re-cycled school uniforms from a Perth school found their way into a local school for their soccer and band members in Camotes Island Philippines! Next time you think of throwing stuff...think again! Thank you Scotch College Perth! With Phase 1 completed and more sites are offered to BFJ to build, we are encouraged to seek more donors to adopt a family and give a one time gift of a lifetime to the homeless. Please contact us if you are compelled to help us put a roof above the heads of one homeless family, not by their choice but due to natural disasters like earthquakes and typhoons. For as little as $2,500.00 fully tax exempt, you can hand the keys to one homeless family 3-6 months from now! The dates, times and venues for these planned events are to be confirmed, but stay tuned to our website, Facebook page and future newsletters for more information. Please pray for the next 100 homes for Adopt A Family appeal and be one of God’s champions of His homeless victims of disasters. Praise God, tax exempt status extended, refer to link below. Proverbs 19:17. Please continue to pray BFJ mission partners, who serve Him day in & day out in the mission fields whom we have worked with like the Missionaries of God’s Love, The Ursuline Sisters, the Missionaries of the Poor, the Missionaries of Charity, the Holy Family Centre, Spanola Sisters, YWAM Cebu, The Little Sisters of the Poor in Perth, BFJ team in Perth and Philippines.